If you are unfortunate enough to be caught in the NICU during the Christmas season, various groups, persons and staff will try to make the holiday a little bit brighter for you given your set of circumstances. Two years ago when we found ourselves stuck in a never ending cycle of ringing alarms, blood draws and vent changes, I would invariably arrive at Liam's isolette to find unexpected, random packages festooned in holiday adornments. Sometimes the gifts would be cheap and cheesey (little resin angels, stuffed animals) and at other times the gifts would be very useful and practical (gift cards to the cafeteria). On one of those days, one of the gifts I received turned out to be one of my most favorite gifts. Ever. I had arrived at the bedside to find a simple, plain glass ornament that had been turned into a beautiful reminder of my son's first Christmas out in the big world. 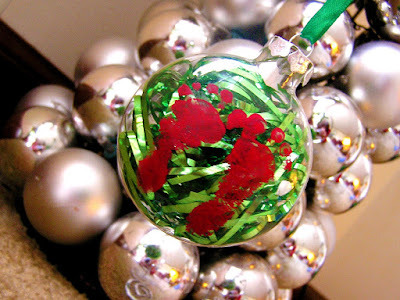 On the front were his tiny, barely an inch long feet, stamped in red. On the back were the words "Liam's First Christmas 2007". This ornament is so special to me that it takes a prominent place now in our Christmas decorating. It even has it's own stand so it doesn't get lost in all of the other special ornaments on our tree and it is prominently displayed on our tv stand. It's a precious reminder of so many things, but most important to me is it's unexpected arrival and the heartfelt sincerity behind it. This year for Christmas, I received another unexpected and heartfelt gift. While pregnant with my boys I had joined a message board just for twin moms to be. A few of those moms have continued to follow in Liam's journey and wanted to help. Imagine my surprise when I opened up my email on Christmas Eve. They sent Liam $215 for Christmas in order to help pay for his next round of therapy (we now have $700 of the $3000 needed). To say I was blown away is an understatement. I am very grateful to my fellow twin moms and appreciate so much their willingness to give to Liam. I would thank you all personally but since I don't know who everyone was, I will just have to resort to a generic thank you here. I am truly grateful for your thoughtfulness!